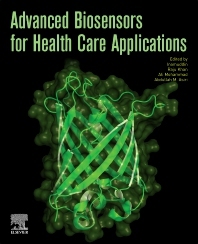 Advanced Biosensors for Health Care Applications highlights the different types of prognostic and diagnostic biomarkers associated with cancer, diabetes, Alzheimer's disease, brain and retinal diseases, cardiovascular diseases, bacterial infections, and other electrochemical biosensor techniques used for the early detection of specific diseases. As recent developments on the nanoscale for biomedical diagnosis devices continues to grow and expand into new markets, this book describes the need for novel strategies for developing a new class of assay systems that operate in real-time, also discussing the selection of sensor components and the operational parameters for each efficient sensing platform. Recent studies reported that there are several diagnostic methods available, but the major issue is the sensitivity and selectivity of these approaches. Biosensors are shown to be superior tools due to their proven high sensitivity and selectivity. Therefore, this book explores the potential of nano-multidisciplinary science to design and develop smart sensing technology using micro-nano electrodes, novel sensing materials, integration with MEMS, miniaturized transduction systems, novel sensing strategy i.e., FET, CMOS, System-on-a-Chip (SoC), Diagnostic-on-a-Chip (DoC), and Lab-on-a-chip (LOC), for diagnostics and personalized health care monitoring. Inamuddin is currently working as an Assistant Professor in the Chemistry Department, Faculty of Science, King Abdulaziz University, Jeddah, Saudi Arabia. He is also a permanent faculty member (Assistant Professor) at the Department of Applied Chemistry, Aligarh Muslim University, Aligarh, India. He obtained a Master of Science degree in Organic Chemistry from Chaudhary Charan Singh (CCS) University, Meerut, India, in 2002. He then received his Master of Philosophy and Doctor of Philosophy degrees in Applied Chemistry from Aligarh Muslim University (AMU), India, in 2004 and 2007, respectively. He has extensive research experience in multidisciplinary fields of Analytical Chemistry, Materials Chemistry, and Electrochemistry and, more specifically, renewable energy and environment. He has worked on different research projects as project fellow and senior research fellow funded by University Grants Commission (UGC), Government of India, and Council of Scientific and Industrial Research (CSIR), Government of India. He has received the Fast Track Young Scientist Award from the Department of Science and Technology, India, to work in the area of bending actuators and artificial muscles. He has completed four major research projects sanctioned by University Grant Commission, Department of Science and Technology, Council of Scientific and Industrial Research, and Council of Science and Technology, India. He has published 138 research articles in international journals of repute and eighteen book chapters in knowledge-based book editions published by renowned international publishers. Additionally, he has published forty-two edited books and is an editorial board member and associate editor for a number of journals. He has attended as well as chaired sessions in various international and national conferences. He has worked as a Postdoctoral Fellow, leading a research team at the Creative Research Initiative Center for Bio-Artificial Muscle, Hanyang University, South Korea, in the field of renewable energy, especially biofuel cells. He has also worked as a Postdoctoral Fellow at the Center of Research Excellence in Renewable Energy, King Fahd University of Petroleum and Minerals, Saudi Arabia, in the field of polymer electrolyte membrane fuel cells and computational fluid dynamics of polymer electrolyte membrane fuel cells. His research interest includes ion exchange materials, a sensor for heavy metal ions, biofuel cells, supercapacitors and bending actuators. Raju Khan is a Senior Scientist & Group Leader at Analytical Chemistry Group, CSIR-North East Institute of Science & Technology, Jorhat, Assam, Govt. of India. He received his MSc degree in Inorganic Chemistry and PhD in Physical Chemistry from Jamia Millia Islamia, Central University, New Delhi, India, 2002 & 2005, respectively. Thereafter, he worked as a Postdoctoral Fellow at the “Sensor Research laboratory” Department of Chemistry, University of the Western Cape, Cape Town, South Africa, in the year 2005-06 and also worked as a Fast Track Young Scientist at CSIR-National Physical Laboratory, New Delhi Govt. of India. Dr Khan was involved in synthesize of novel materials to fabricate electrochemical biosensor to detect target disease risk biomarker for health care monitoring. Dr Khan is also engaged other external project funding National & International collaborative project, Indo-Czech Republic & Indo-Russia. After successful completion of awarded tenure, Dr. Khan joined as Scientist at Analytical Chemistry Division, CSIR-North East Institute of Science and Technology (NEIST), a research laboratory of Council of Scientific and Industrial Research (CSIR), Govt. of India and he is also promoted and currently working as a Senior Scientist. He was awarded the BOYSCAST fellowship to work work as a visiting scientist for one year at University of the Texas at Sanantonio, USA. Since then, Dr. Khan has served with more than 10 years R&D and teaching experience, producing high quality research, mentoring students, and supporting analytical division as outsource facility. Ali Mohammad is Emeritus Professor of Chemistry in the Department of Applied Chemistry, Faculty of Engineering and Technology, Aligarh Muslim University, Aligarh, India. His scientific interests include physico-analytical aspects of solid-state reactions, micellar thin layer chromatography, surfactants analysis, and green chromatography. He is the author or coauthor of 250 scientific publications including research articles, reviews, and book chapters. He has also served as editor of Journal, Chemical and Environmental Research being published from India since 1992 and as the Associate Editor for Analytical Chemistry section of the Journal of Indian Chemical Society. He has been the member of editorial boards of Acta Chromatographica, Acta Universitatis Cibiniensis Seria F. Chemia, Air Pollution, and Annals of Agrarian Science. He has attended as well as chaired sessions in various international and nation conferences. Dr. Mohammad obtained his M.Phil. (1975), Ph.D. (1978), and D.Sc. (1996) degrees from Aligarh Muslim University, Aligarh, India. He has supervised 53 students for Ph.D./M.Phil. and M.Tech. degrees. Prof. Abdullah M. Asiri has been the Head of the Chemistry Department at King Abdulaziz University, Saudi Arabia, since October 2009, and he is the founder and the Director of the Center of Excellence for Advanced Materials Research. He graduated from King Abdulaziz University (KAU) with a BSc in Chemistry in 1990 and a PhD from University of Wales, College of Cardiff, UK in 1995. He was promoted to a Professor in 2004. His research interest covers color chemistry, synthesis of novel photochromic, thermochromic systems, synthesis of novel coloring matters and dyeing of textiles, Materials Chemistry, Nanochemistry and nanotechnology Polymers and plastics. He is the main author of ten books in different chemistry disciplines. Prof. Asiri is the Editor-in-Chief of King Abdulaziz University Journal of Science. A major achievement of Prof. Asiri is the discovery of tribochromic compounds, a class of compounds which change from slightly or colorless to deep colored when subjected to small pressure or when grind. This discovery was introduced to the scientific community as a new terminology Published by IUPAC in 2000. This discovery was awarded a patent from European Patent office and from UK patent and some other patents office in Europe. Prof. Asiri has been involved in many committees at the KAU level and also on the national level, he took a major roll in the Advanced materials committee working for KACST to identify the National plan for science and technology in 2007. Prof. Asiri played a major role in advancing the chemistry education and research in KAU, he has been awarded the best Researchers from KAU for the past five years. He also awarded the Young Scientist award from the Saudi Chemical society in 2009, and also the first prize for the distinction in science from the Saudi chemical society in 2012. He also received a recognition certificate from the American Chemical society (Gulf region Chapter) for the advancement of chemical science in the Kingdome. Also he received a Scopus certificate for the most Publishing Scientist in Saudi Arabia in chemistry in 2008.He is also a member of the Editorial Board of Pigments and Resin Technology (UK), Organic Chemistry in Sight (New Zealand), Designed Monomers & Polymers and Journal of Single Molecule Research . He is the Vice- President of Saudi Chemical Society (Western Province Branch).